In his research, Dr. Peter van Lidth de Jeude (C'04) focuses on modern European history with a special emphasis on Germany. 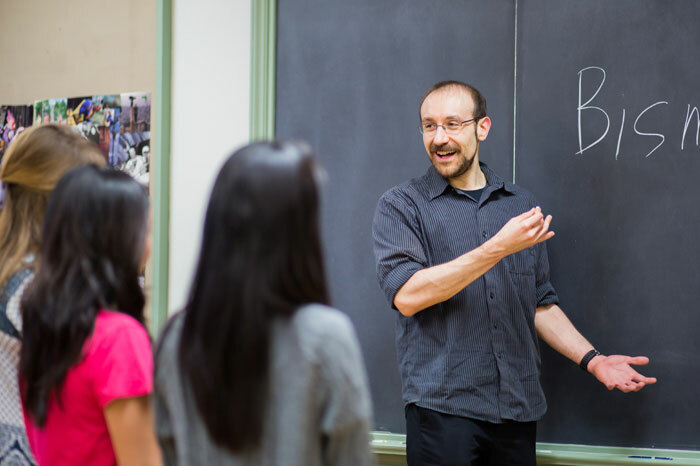 Prior to teaching at Principia, he served as a graduate teaching assistant at the University of North Carolina, Greensboro, and at Pennsylvania State University, where he also served as an instructor. Dr. van Lidth de Jeude shares his global perspective on history with students in his courses on early American history, non-Western history, and historical research methods. I appreciate the sense of community here. It’s such a blessing to interact with colleagues and students on a daily basis in a way that you often can’t at a larger institution. I have the opportunity to really get to know people and hear their perspectives in an atmosphere devoted to learning and growth. It makes every day exciting, enlightening, and fulfilling. My most recent large-scale project was my dissertation on the German occupation bureaucrats in Belgium and Poland during the First World War. I examined frequently ignored participants and how they viewed themselves, their tasks in the occupied territories, and the constant dysfunction they faced and helped to perpetuate. I also looked at how a lack of clear organization and goals can doom any endeavor and how it is almost impossible to fix such large issues on the fly. Find what you are passionate about and pursue that. College is a time for growth and discovery, and you can’t do that if you follow a narrow path. You need to be exposed to new topics and new ways of thinking so that you can stretch and grow—that is really the beauty of the liberal arts. So, make the most of your courses and find that subject (or those subjects!) that you are really excited about. Once you have done that, give it your all, because that passion is going to make you far more successful in the long run than following a path you find safe but unfulfilling. I come from a long line of teachers, so I was exposed to it from a very young age. But it wasn’t until I first got in front of a classroom that I realized why family members loved it so much. I get to learn as much as I teach, and that’s a pretty fantastic way to spend my days. When you study a subject for a very long time, you tend to have a lot of preconceived notions and assumptions that you don’t always challenge, and it is wonderful to discuss the material with students who are being exposed to it for the very first time. I cannot begin to count the number of times I’ve had to reassess my own perspective on a subject after hearing a new take I had never considered. The emergence of the internet and the incredible amount of data that we have access to at any moment has required a rethinking about how to teach history. I often tell my students that all of them have in their pockets a device that is connected to the totality of human knowledge—that thing they use to send cat pictures to one another. But that means that what we formerly taught students in history classes, namely the key dates and facts and where to find more information, has given way to teaching them how to deal with the flood of information they are constantly bombarded with, how to determine what information is useful and what isn’t, and how to use that information effectively. We have gone from teaching them how to find water in the desert to how to swim in the ocean. And the only way to do that is to challenge them with a lot of information, multiple perspectives, and assignments that require not memorization but individual and critical thought. I honestly don’t know that I can picture myself being as happy doing anything else as I am teaching. It was a long, hard road to get here, but it was absolutely worth the effort. I am a good source of information on where to find the best baked goods in any city I’ve lived in. I started exploring bakeries while doing research in Berlin and have found it a unique—and delicious—way to explore parts of a city I might not have seen otherwise. I love getting out and exploring—walking around a neighborhood I have never been to, visiting a museum, exploring bookstores to feed my reading habit, or continuing my eternal quest to find the best baked goods. I also love spending a quiet day reading a good book at home or revisiting my love of movies, either at home or in the theater, or just spending a day catching up with friends and talking about an infinite number of topics. I believe that adventure is ultimately a state of mind, so it’s never hard for me to find one when the opportunity presents itself.